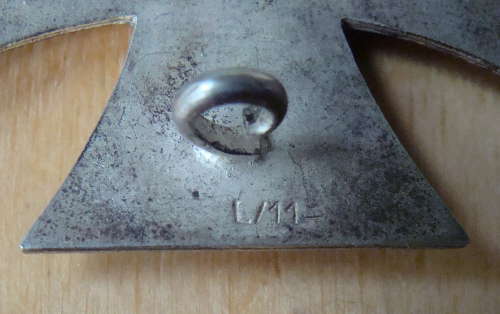 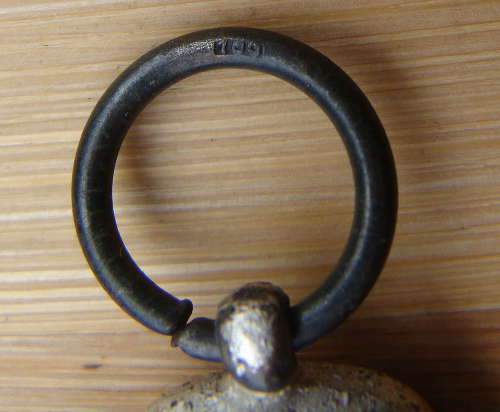 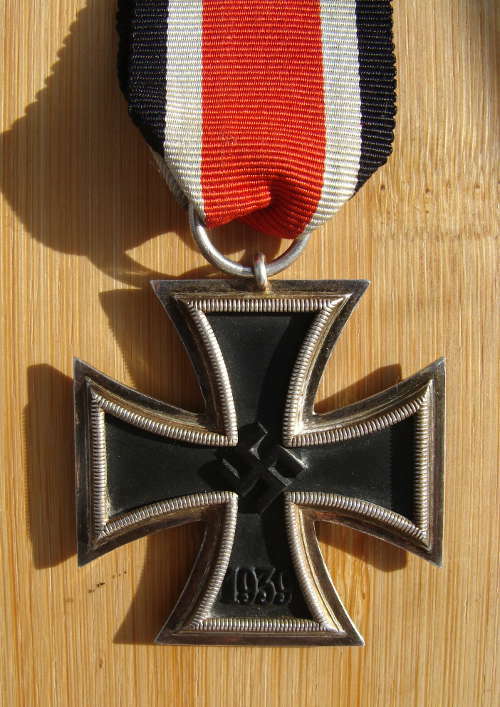 WW2 IRON CROSS 2nd CLASS - MAKER MARKED "55"
WW2 IRON CROSS 2nd CLASS - MAKER MARKED "4"
WW2 IRON CROSS 2nd CLASS - MAKER MARKED "93"
WW2 IRON CROSS 2nd CLASS - MAKER MARKED "100"
WW2 Iron Cross 2nd class - maker marked "55" for maker 'J. 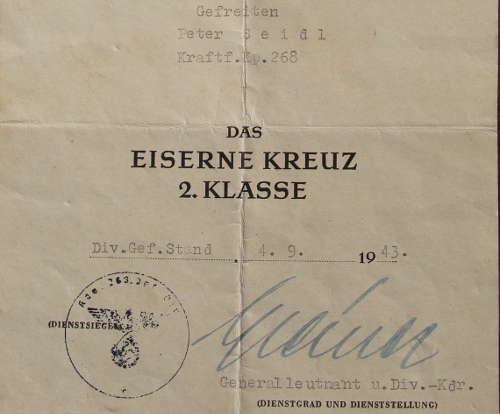 E. Hammer & Sohne' of Geringswalde - with envelope of issue also with maker mark 'J. 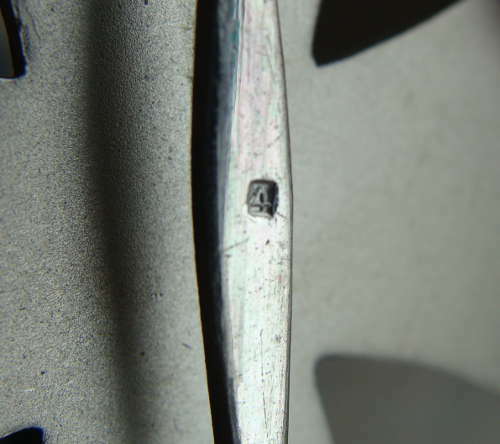 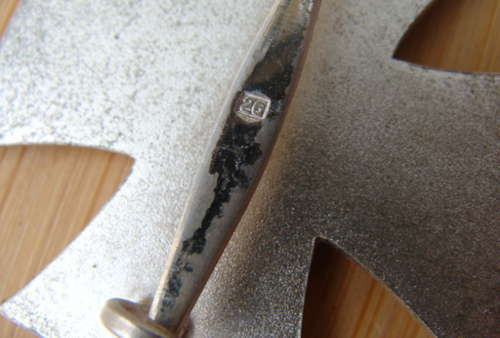 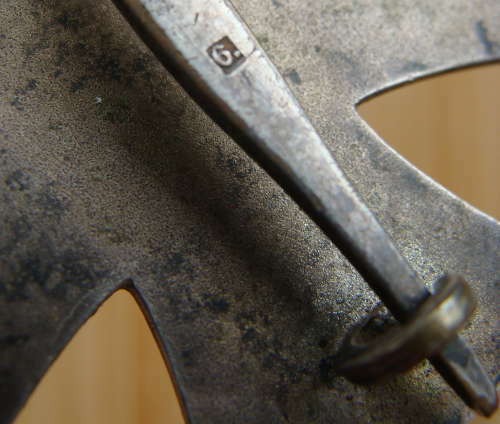 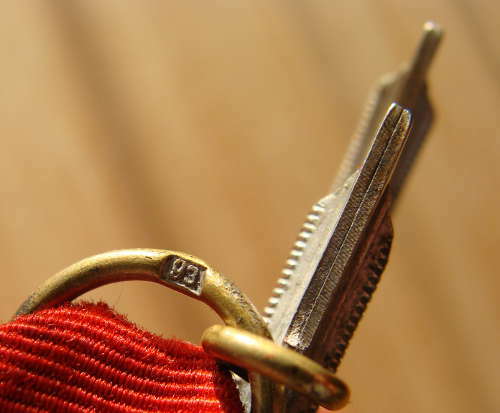 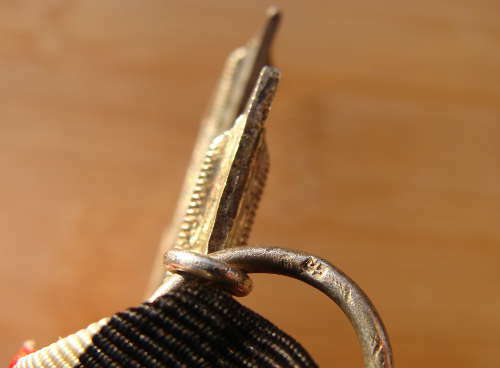 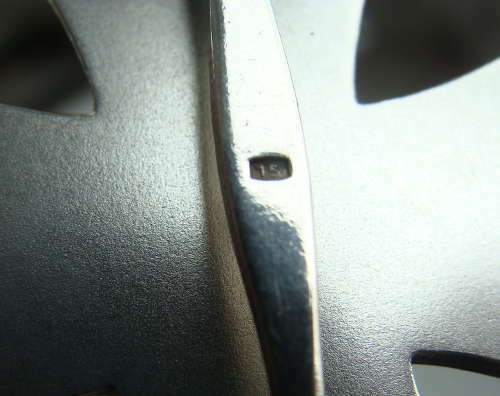 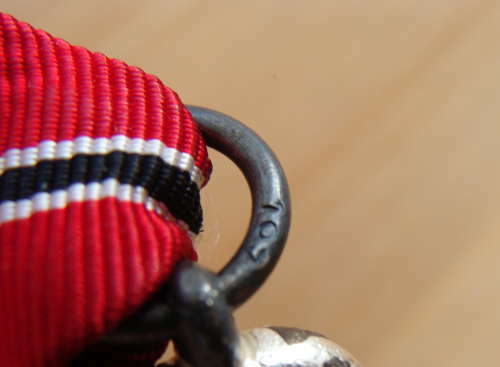 E. Hammer & Sohne' - with original period ribbon. 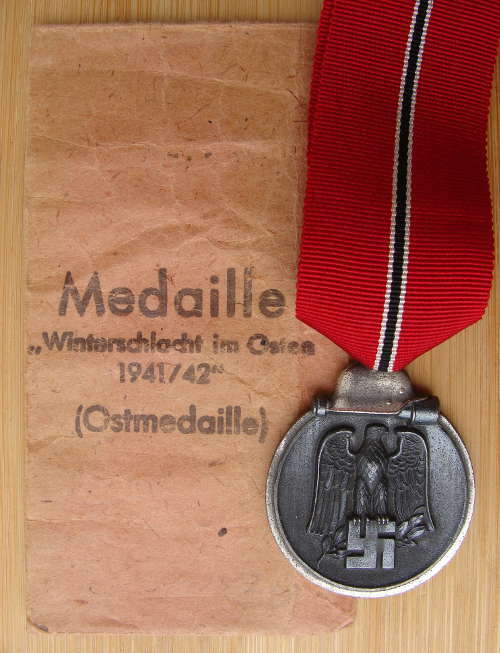 Medal, ribbon and envelope in good original condition and nicely aged. 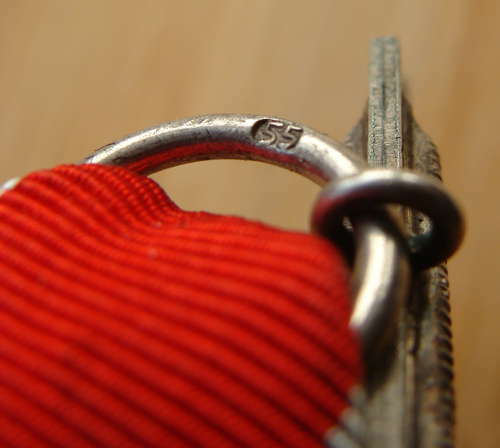 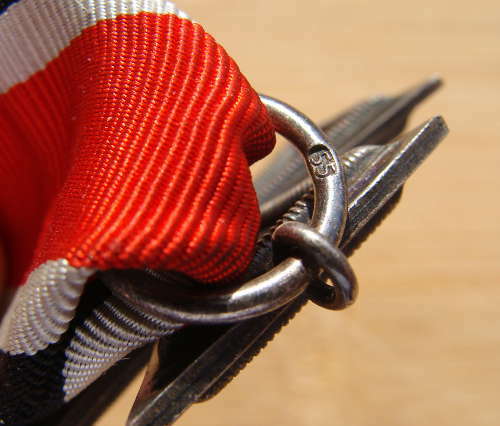 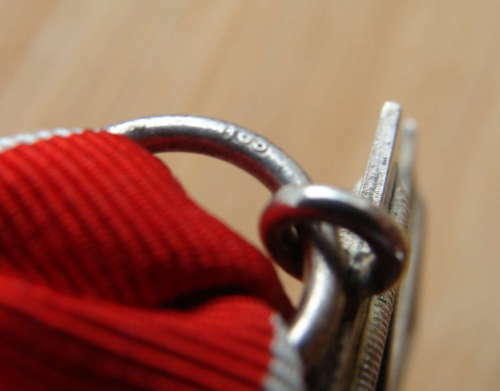 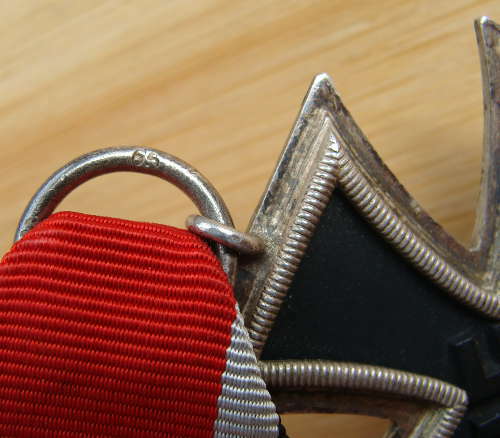 Medal and ribbon in first class condition, envelope in used, original and complete condition and nicely aged. 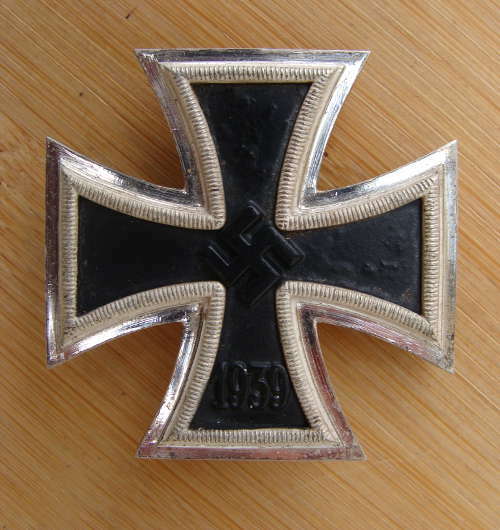 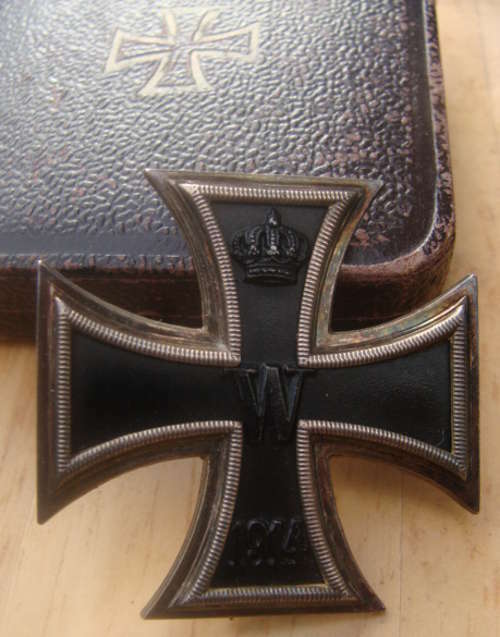 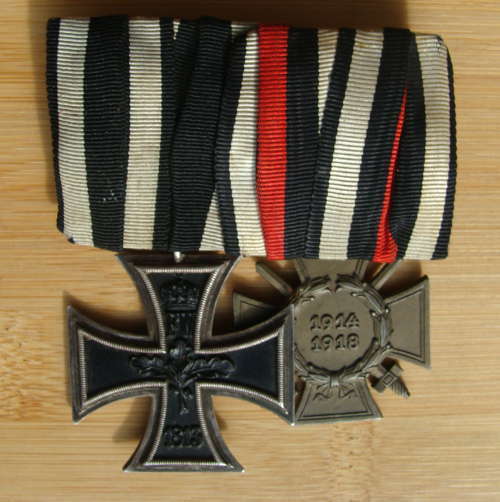 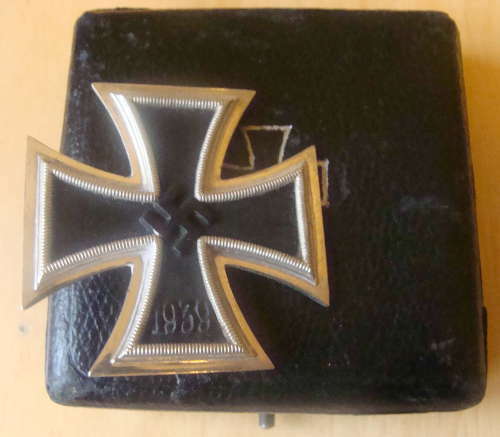 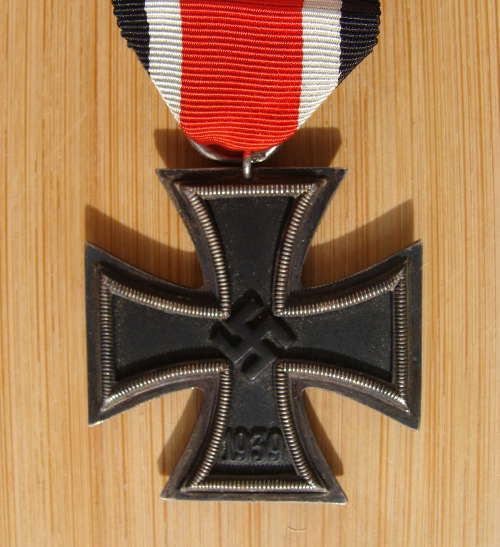 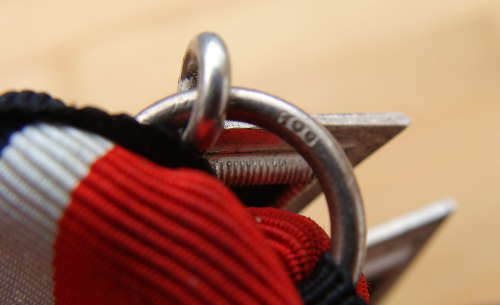 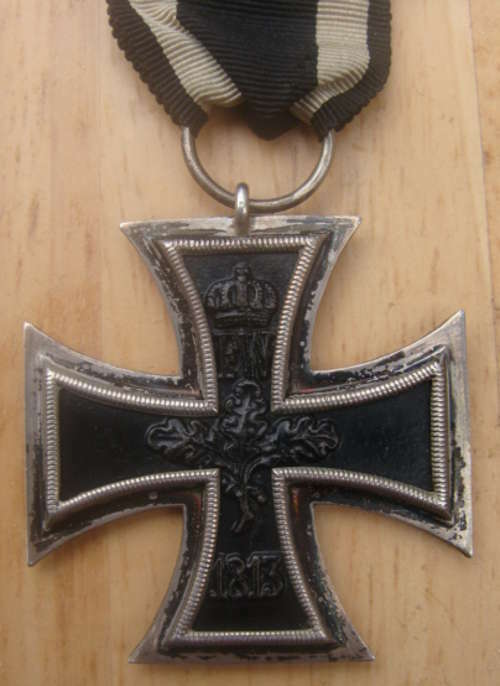 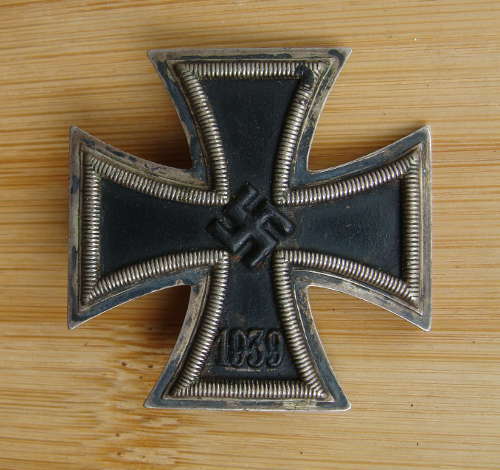 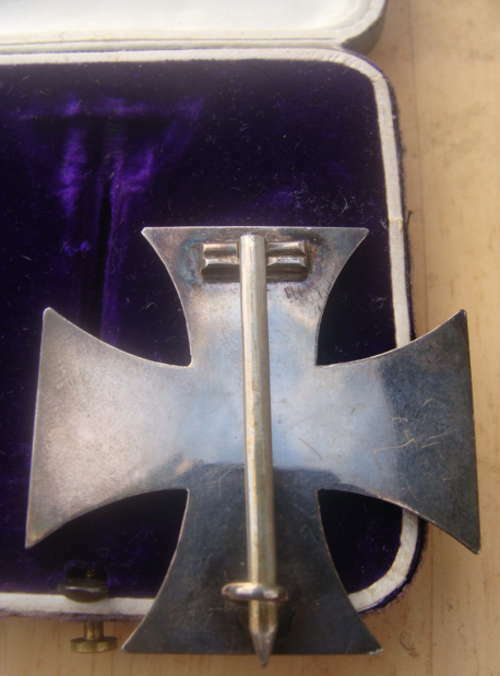 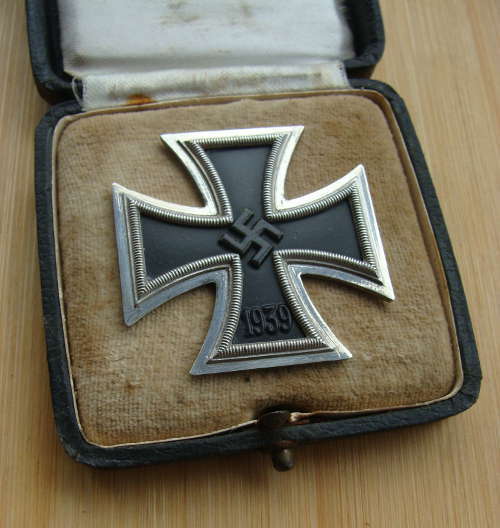 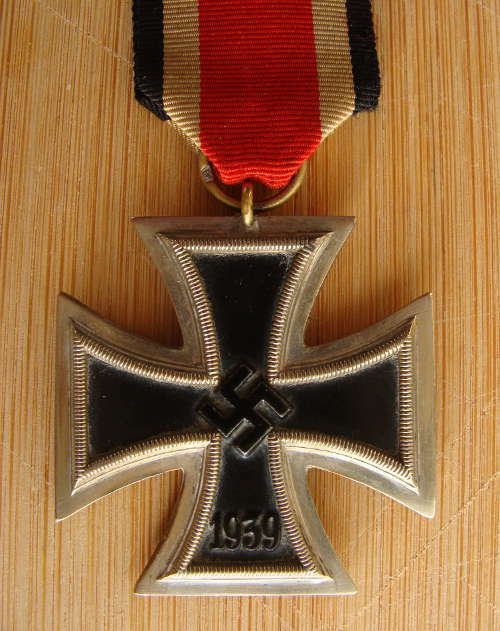 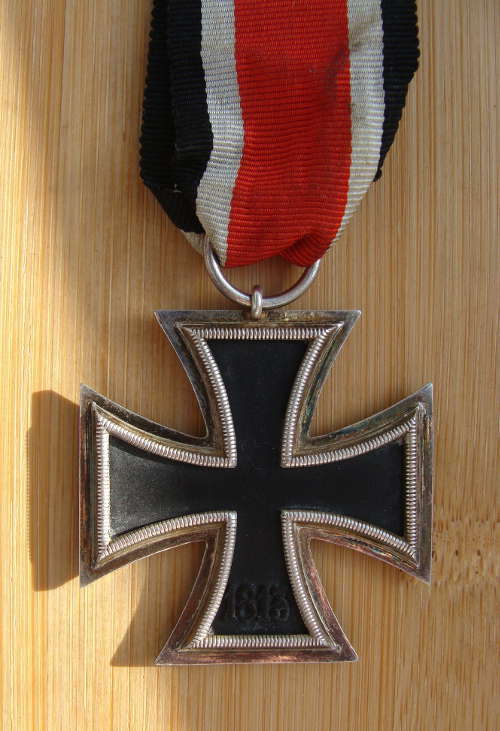 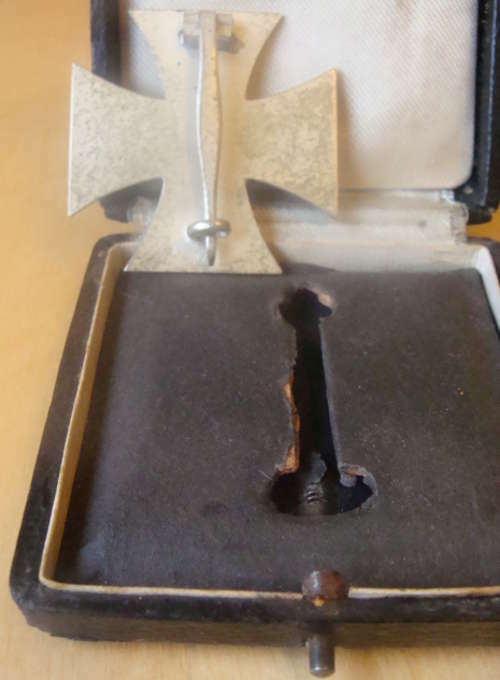 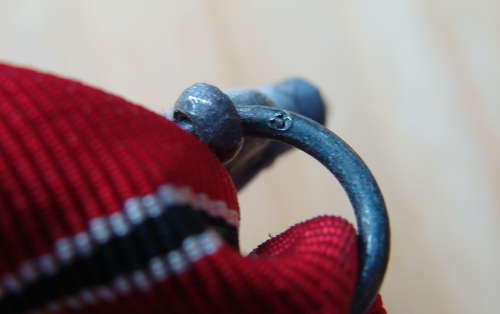 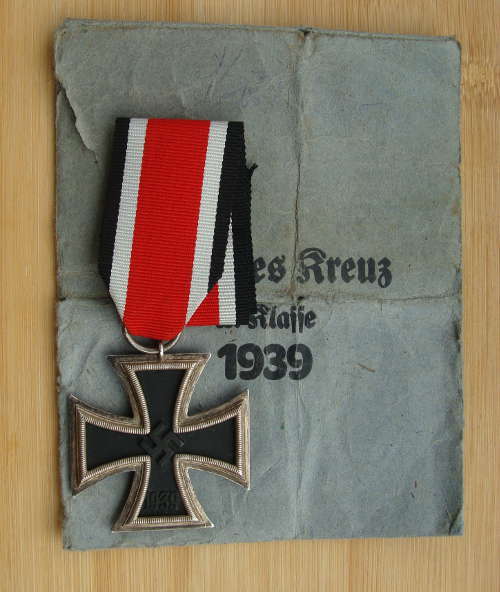 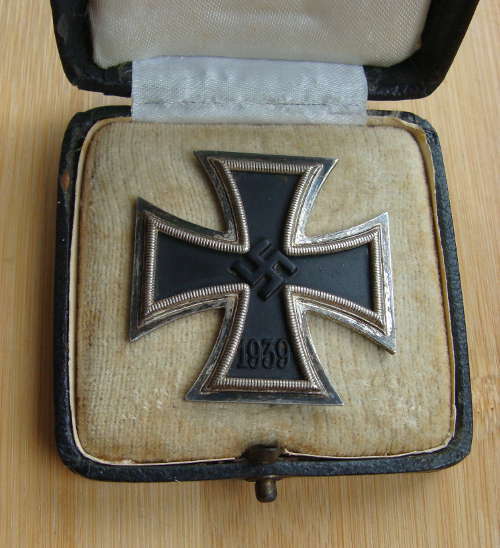 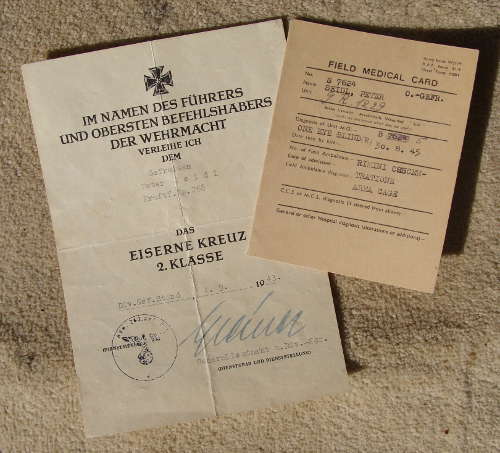 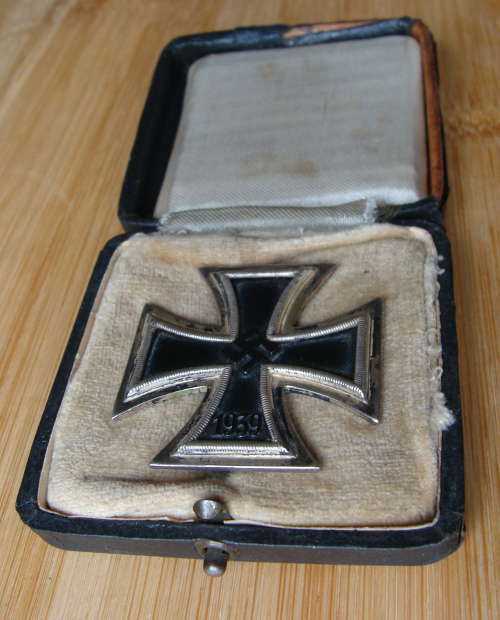 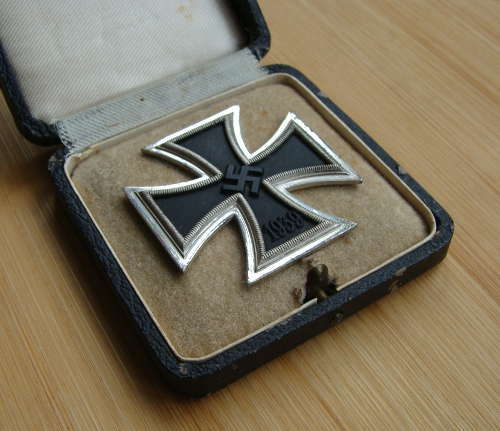 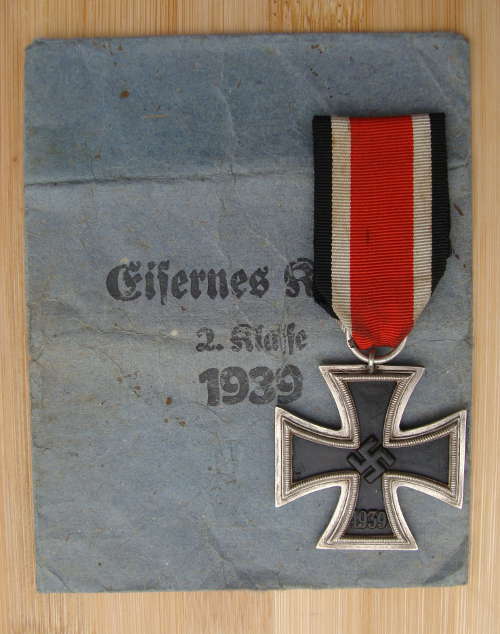 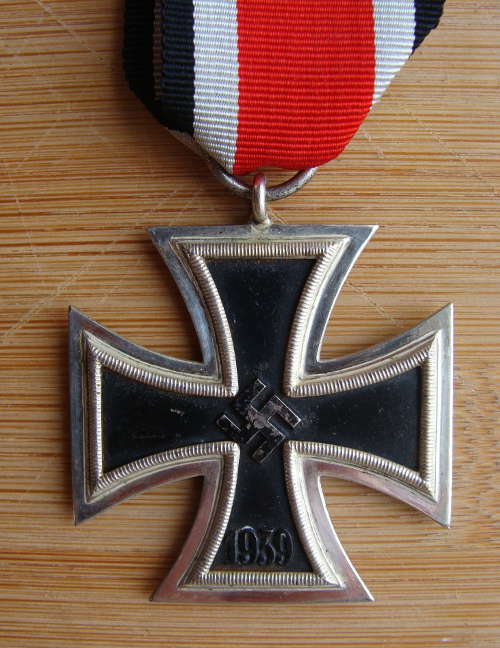 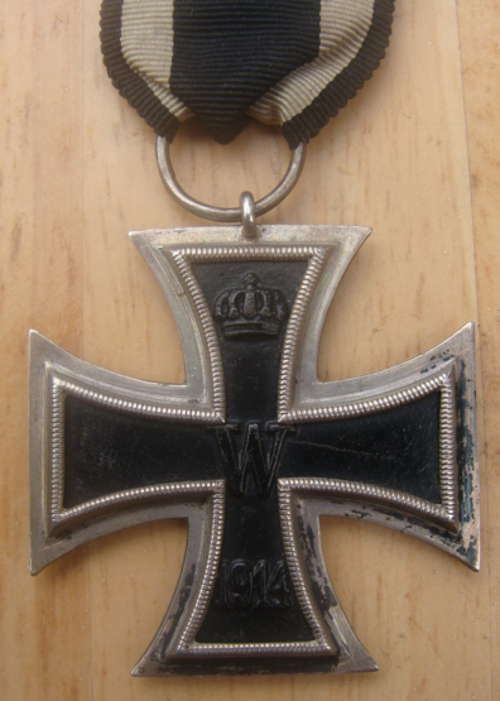 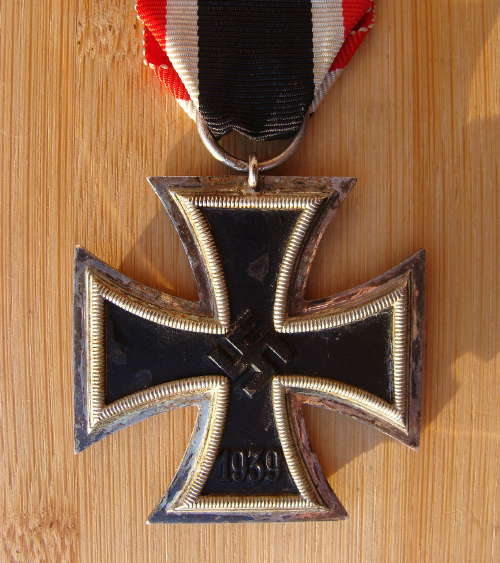 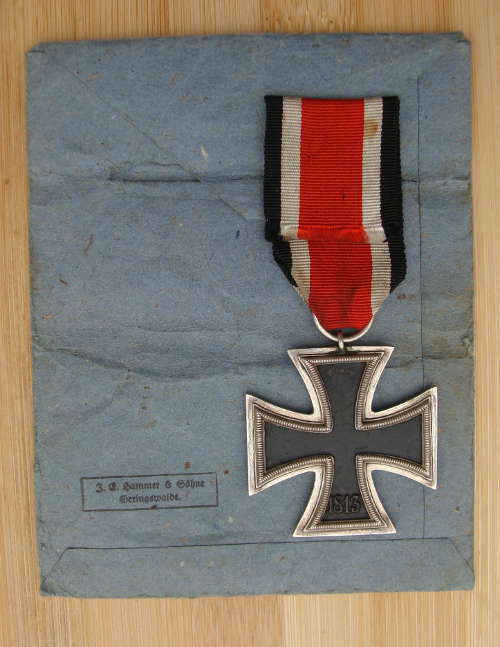 Iron Cross 2nd class, maker marked L/11 for maker 'Wilhelm Deumer of Ludenscheid' in original totally mint condition - with unused original period ribbon. 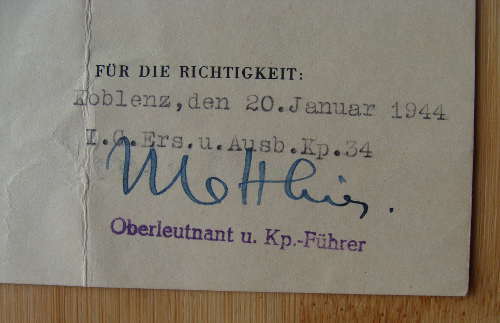 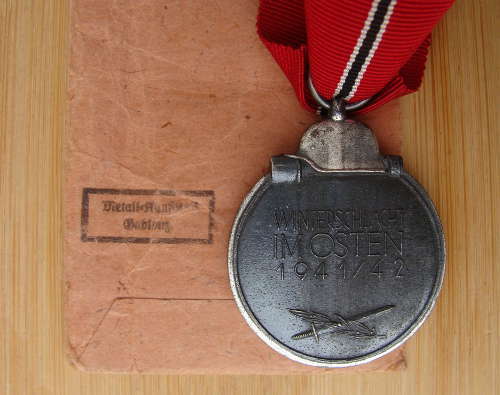 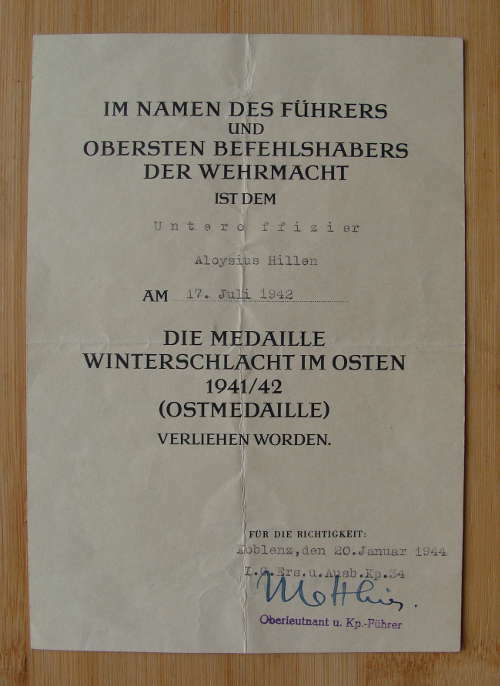 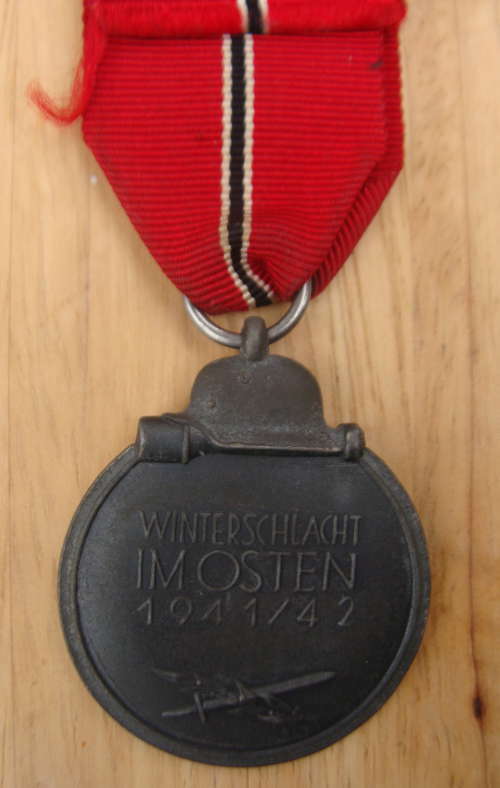 Jasper can be seen wearing the Iron Cross ribbon to his uniform but obviously did not wear the medal itself - Medal Award Certificate signed in person by General Admiral Boehm in charge of the Norwegian Fleet, in Oslo, dated 3 June 1941 - Minesweeper's Badge - SA Sports Badge - supporting documentation, including reference from his employer aboard a steam ship, a letter from the Mayor confirming his Aryan ancestry and a recommendation from his Commander, etc. 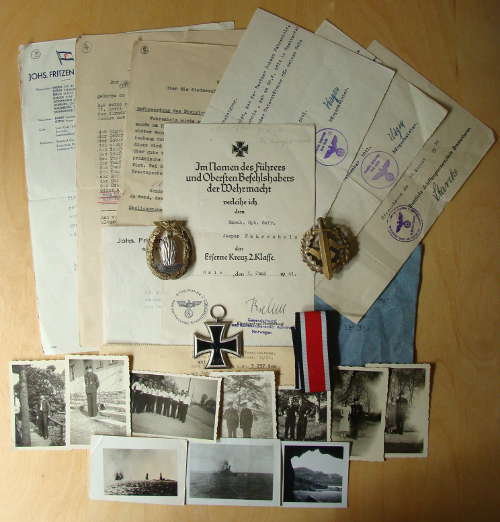 - personal photographs some showing uniform with award and badges, others showing action at sea. 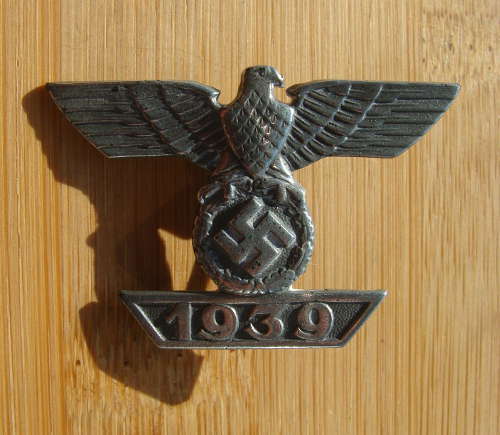 We are confident that we would be financially be better off selling these individually but would regard doing so as unethical after more than 70yrs together. 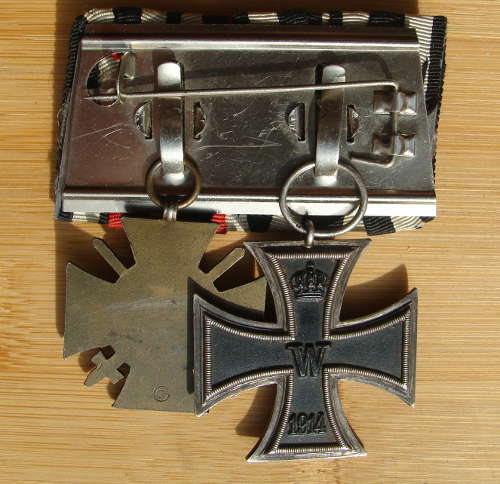 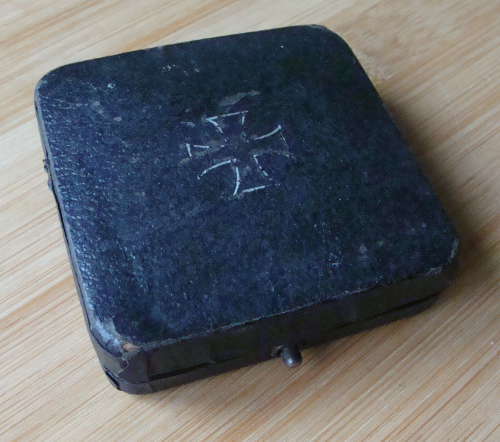 WW2 IRON CROSS 1st CLASS - MAKER MARKED "26"
WW2 IRON CROSS 1st CLASS - MAKER MARKED "6"
WW2 IRON CROSS 1st CLASS WITH BOX - MAKER MARKED "L/11"
WW2 IRON CROSS 1st CLASS WITH BOX - MAKER MARKED "100"
WW2 IRON CROSS 1st CLASS WITH BOX - MAKER MARKED "4"
WW2 IRON CROSS 1st CLASS WITH BOX - MAKER MARKED "15"
An Ostfrontmedaille (East Front Medal) - maker marked very small but appears to be '100' for Rudolf Wachtler & Lange of Mittweida (the vast majority of East Front Medals were not maker marked) - material alloy - original envelope of issue marked "Deschler & Sohn, Munchen" but their code is '1'? 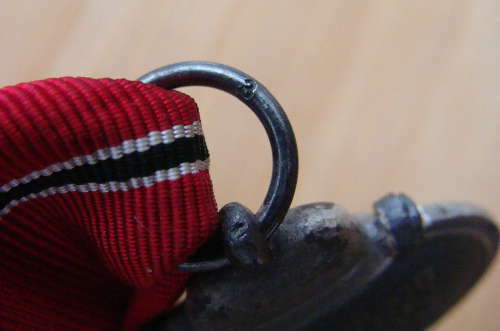 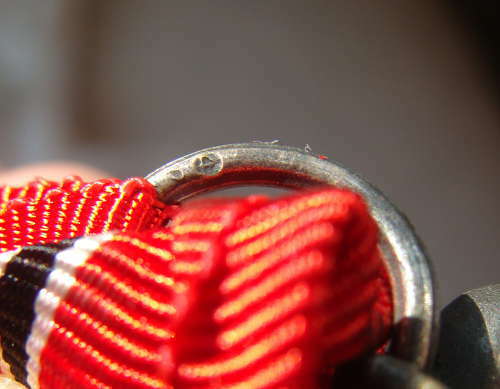 - original period unused ribbon. 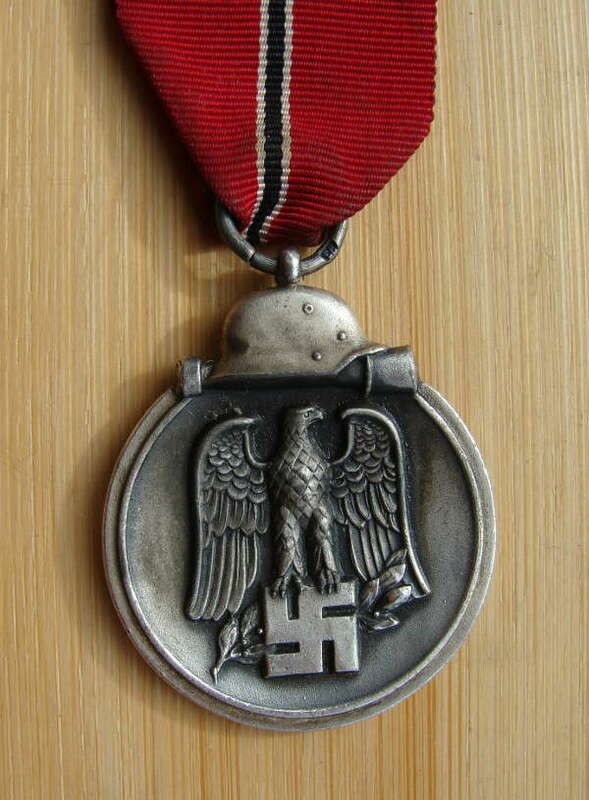 Awarded to personnel both military and civilian serving on the Russian front 15th November 1941 to 15th April 1942 although the medal continued to be issued until September 1944 - often refered to as the"Frozen Meat Medal"
Awarded to personnel both military and civilian serving on the Russian front 15th November 1941 to 15th April 1942 although the medal continued to be issued until September 1944 - often refered to as the "Frozen Meat Medal"
The medal is in excellent used condition, with nice aged patina and wear to the paint finish, free from corrosion with original period ribbon. 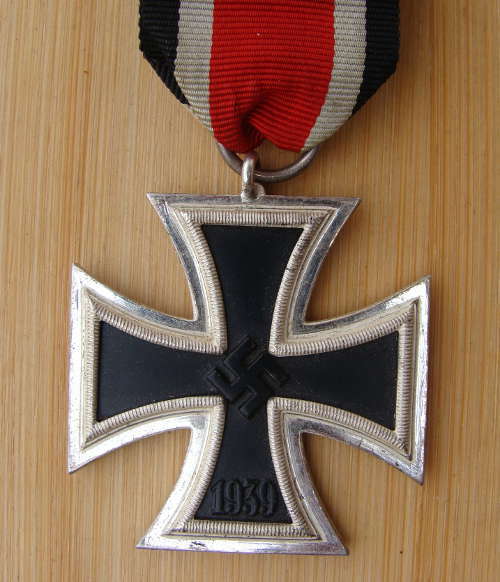 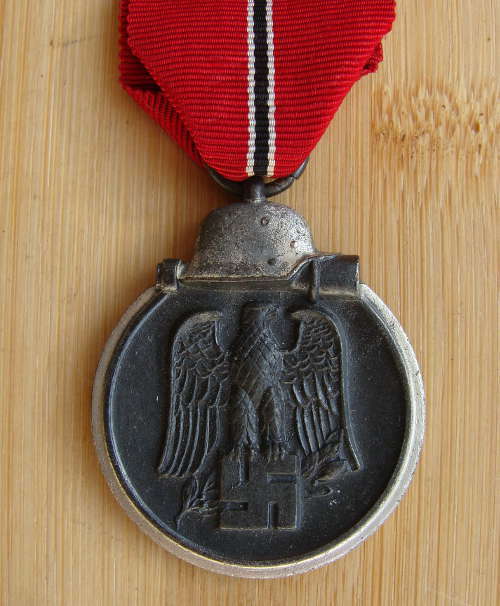 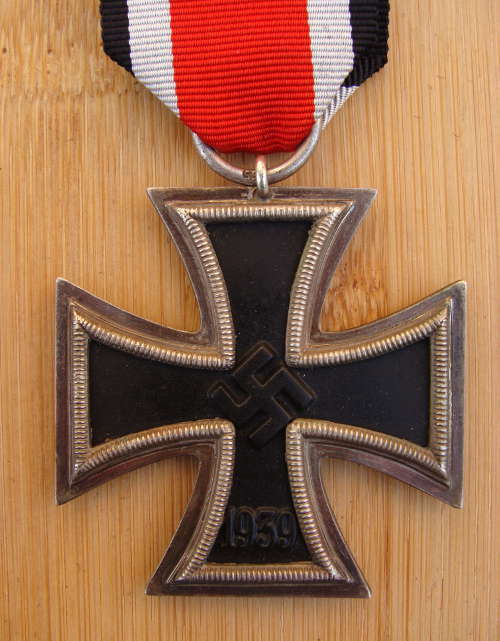 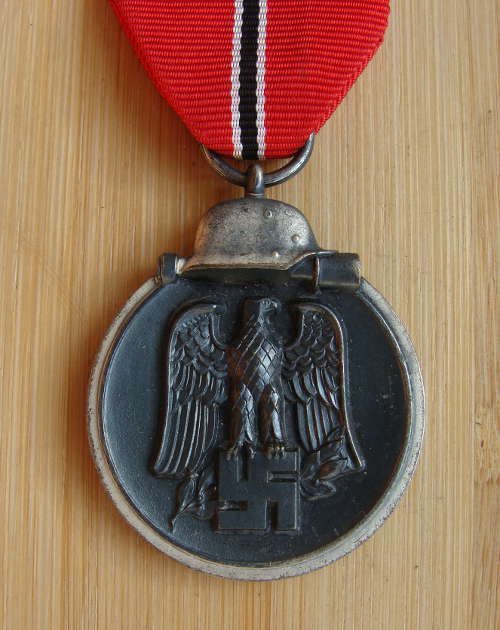 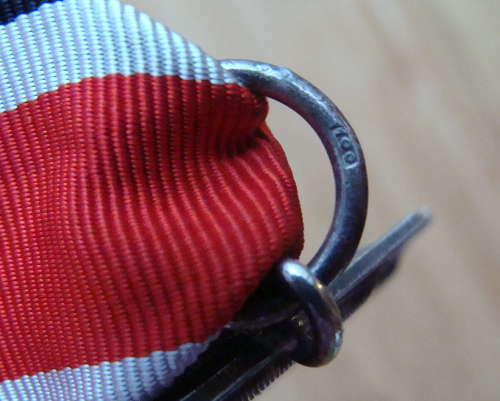 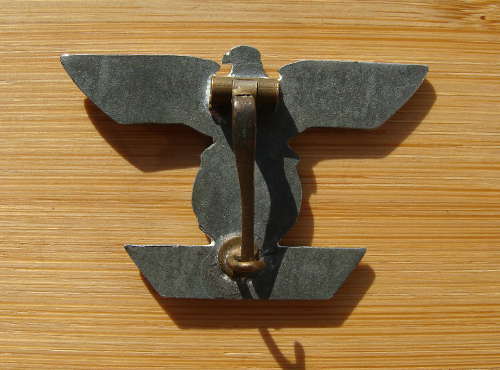 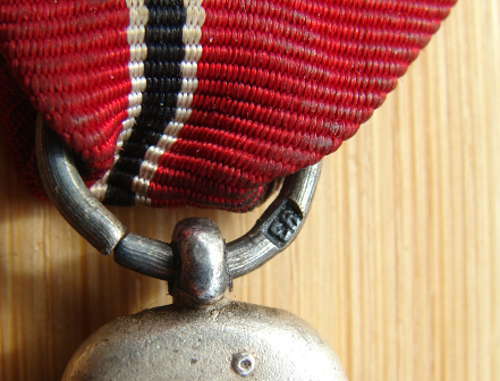 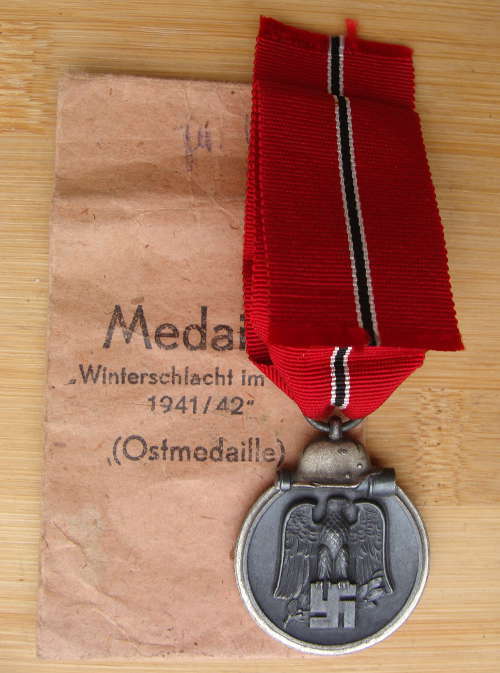 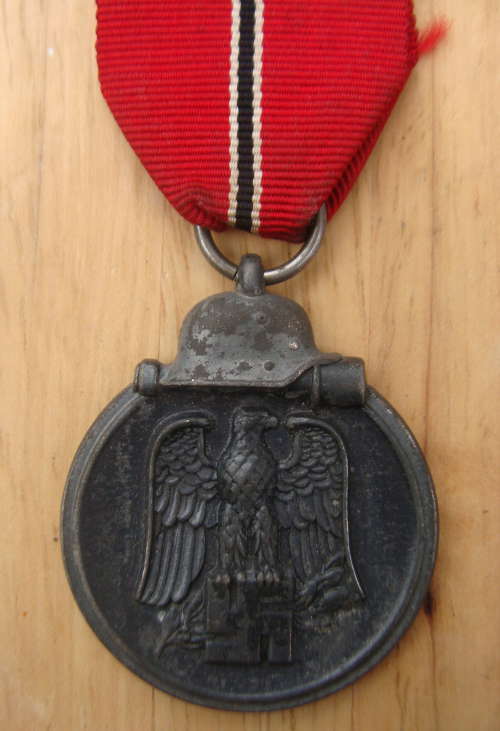 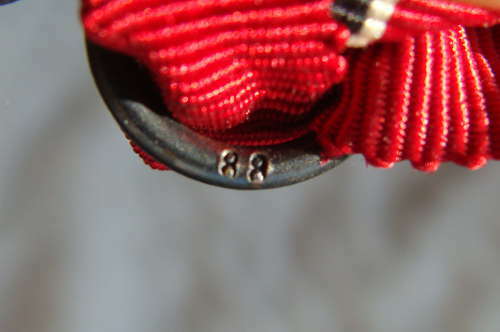 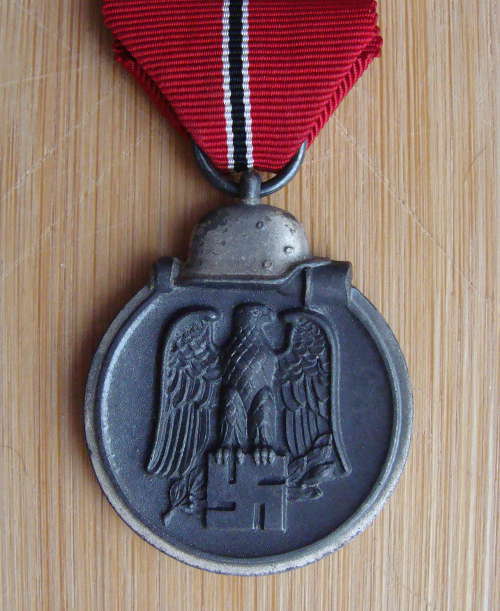 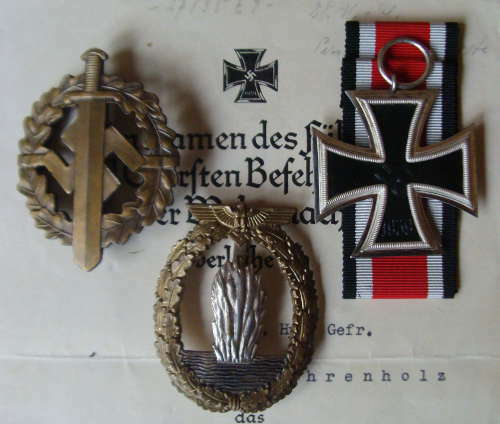 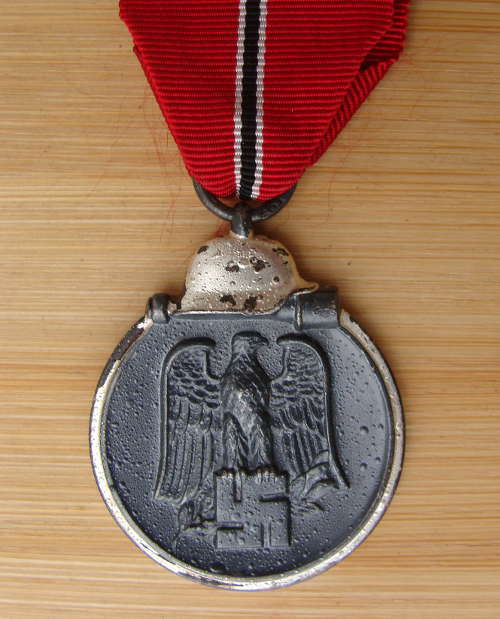 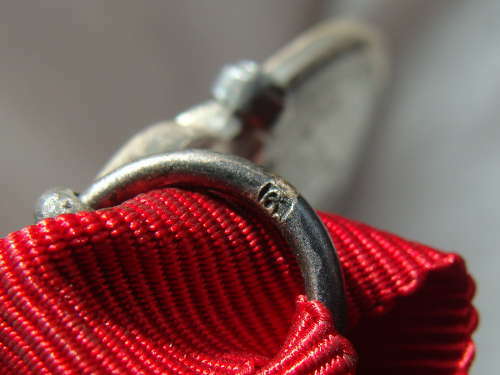 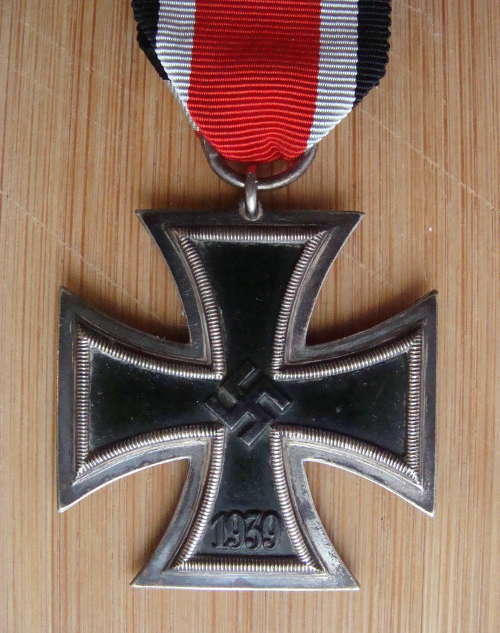 An Ostfrontmedaille (East Front Medal) - material alloy - original period ribbon. 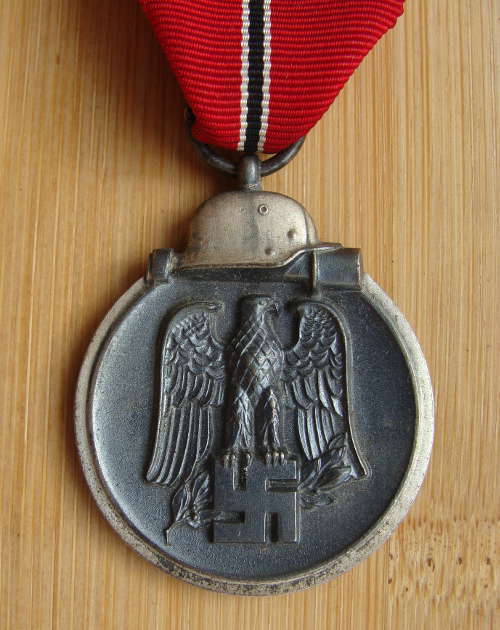 Awarded to personnel both military and civilian serving on the Russian front 15th November 1941 to 15th April 1942 although the medal continued to be issued until September 1944 - often refered to as the"Frozen Meat Medal" - good, original, used condition. 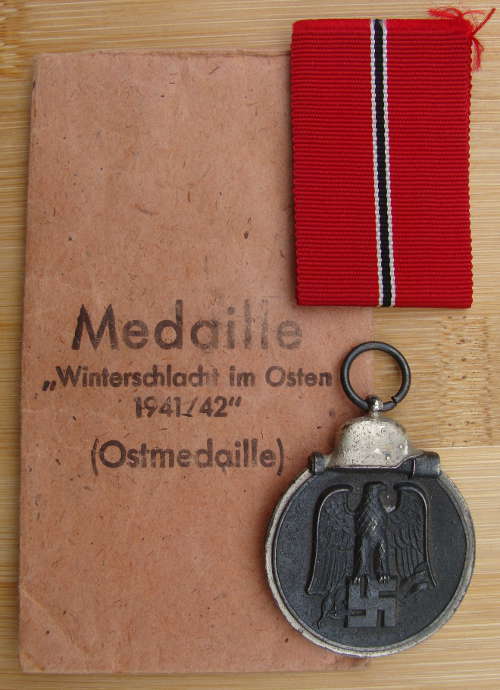 OSTFRONTMEDAILLE (EASTERN FRONT MEDAL) 1941 to 1942 - MAKER MARKED "105"
OSTFRONTMEDAILLE (EASTERN FRONT MEDAL) 1941 - 1942 - MAKER MARKED "88"
OSTFRONTMEDAILLE (EASTERN FRONT MEDAL) 1941 - 1942 - MAKER MARKED "6"
OSTFRONTMEDAILLE (EASTERN FRONT MEDAL) 1941 - 1942 - MAKER MARKED "4"